This DVD-Audio offers state of the art sound quality in stereo and surround. Christian Halten, film composer and head of SYKLIFE Musikverlag, is the producer of the DVD-Audio OFF SPACE. He wants a new dimension to find its way to our music habits. Thirteen electronica tracks composed by different artists from Germany take the listener on an exciting journey beyond the limits of conventional audio recordings. Every song was composed in a six channel surround sound field and recorded at 96 kHz with 24 bit resolution. Crystal clear sonorous playback, subsonic basses and a unique dynamic range create a sound experience of a special kind. The OFF SPACE DVD offers optimum 5.1 surround sound and stereo sound quality in DVD-Audio players. Playback is also possible on DVD-Video players in Dolby Digital AC-3 5.1 and 2.0. Among the artists of OFF SPACE are some well known acts of the German electronic scene like üNN and BeamTeam, who already took part in TV projects like SpaceNight from Bavarian Television and Flowmotion from HR-TV. The composers take all advantages and inspiring possibilities of the six channel surround sound and created with OFF SPACE a reference within the new DVD-Audio sector. The ingredients of the OFF SPACE DVD are electronic beats combined with spheric sounds, from Drum’n Bass and jazzy tunes to relaxing songs in an Air style. The musical spectrum also includes Kraftwerk-like tracks and mystic atmospheres that could have been composed by Jean Michel Jarre. Combined with each audio track there is a video still playback in NTSC format. A new world evolves when micro cosmos meets macro cosmos in a very impressive way. 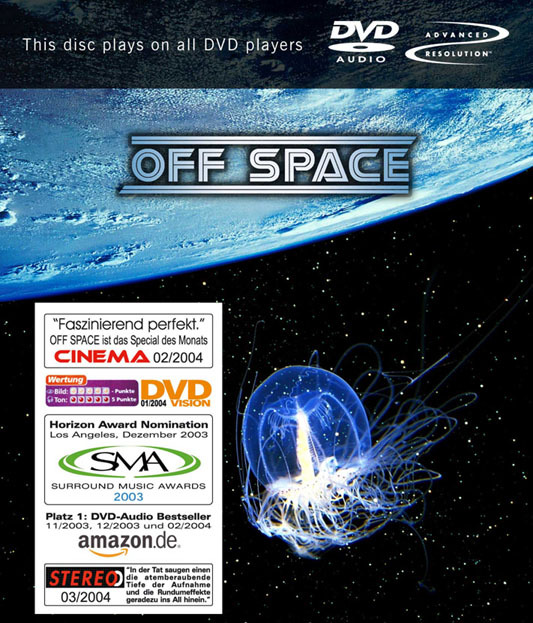 As one of the first composers in Germany, Christian Halten produced the DEEP SPACE DVD in 1998, which became a very successful DVD special interest title. In Cooperation with OEM GmbH he licensed video material from NASA and ESA and composed a new 5.1 surround soundtrack for these space sequences. This product was added to our catalog on Wednesday 01 June, 2005.